There are many towns, villages, museums and beauty spots along the route and many walks to plan. Following are a few ideas but it is by no means exhaustive. The description is written as if travelling on the outward DalesRail train from Blackpool North to Carlisle and describes the stations and some of the significant line side features that are seen from the carriage window. Want to know what the weather might do? Then click the link My Local Weather – a useful weather site for intrepid DalesRailers and others who might want to walk in the dales. 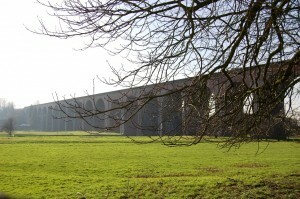 The Ribble Valley section of the line contains a number of major features but the most notable is Whalley Viaduct (sometimes known as Whalley Arches). It is the longest brick built viaduct in Lancashire, is 679 yards long, has 48 spans and is 70 feet above the River Calder. On the right hand side you will see Whalley Abbey and the village and on the right there are views on a clear day towards Longridge Fell, Parlick Hill and beyond. The train now enters Whalley station. For more details about Whalley and Whalley station click here. Did you know that the original name for the town was Cliderhou? This name comes from the Scandinavians who came and settled in the Ribble Valley many years ago. As the train approaches Clitheroe you will see the remains of the Norman Castle on your right. The stone keep was built in 1186 by Robert de Lacy when the Normans settled in the Ribble Valley and is reputed to be the second smallest in England. 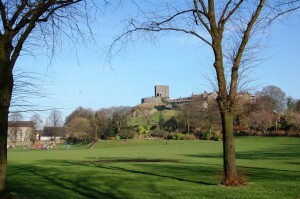 Today Clitheroe is an attractive Lancashire market town that is located in the heart of the Ribble Valley. It has a wide range of shops some of them have been run by the same family for generations. Click here to find out more about bus services in the Ribble Valley and Lancashire. 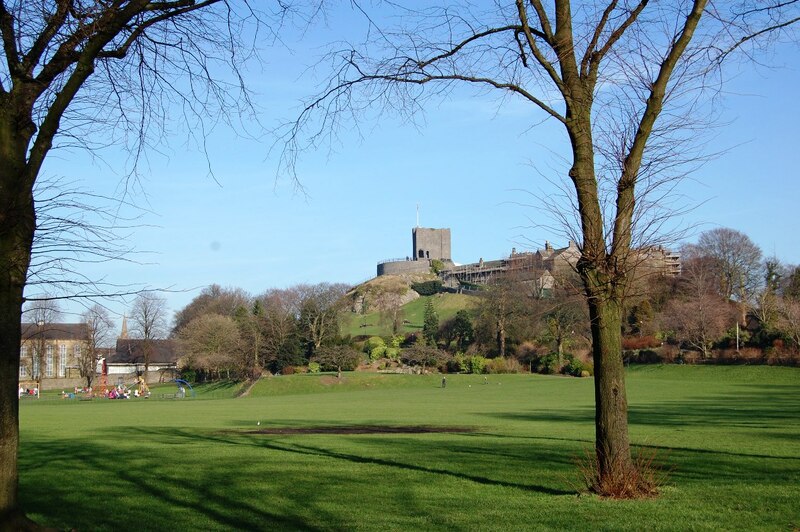 Suggested things to do: visit the Castle Museum and grounds to find out more about Clitheroe and the Ribble Valley. The Museum is open all year and full details can be found by calling 01200 424568 or by clicking here. For more details about Clitheroe and Clitheroe Bus and Rail Interchange click here. 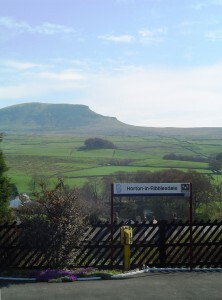 Pendle Hill is visible for much of the journey along the Ribble Valley line. The hill is approximately 1,830 feet high (557metres) and is composed largely of millstone grit. Pendle Hill forms an isolated part of the Forest of Bowland Area of Outstanding Natural Beauty and can be climbed from a number of points including some that are close to Downham village. The Ribble Way is a 70 mile footpath following the river and its valley from the sea to its source. The footpath spans the counties of Lancashire and North Yorkshire and is divided into 7 sections each approximately 10 miles long. Four sections lie within Lancashire following the rivers middle and lower reaches. The Ribble way starts at Longton on the salt marshes of the estuary and passes through this flat estuarine environment to the west of Preston and onto the lush fertile plains between Preston and Clitheroe. The Ribble way then encounters the higher ground towards the county border and continues to its source in North Yorkshire. The Ribble Way can be accessed from a number of stations along our journey including Langho and Clitheroe Interchange. Details of this walk and route maps can be found by clicking here. 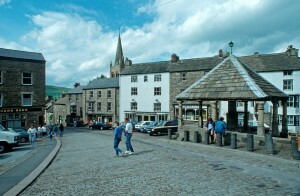 A traditional market town and the starting point for the famous 72 mile Settle to Carlisle line. A town trail is available from the Tourist Information Centre and this describes many of the interesting features of this town. In addition, the town is the starting point for some excellent walks including 3 caves that are close by. An excellent view of the town and surrounding area can be seen from Castleberg Rock just above the town. Not far away is the Watershed Mill Visitor Centre which houses local Dalesmade crafts. About two miles away is the Yorkshire Dales Falconry and Conservation Centre which has a variety of birds of prey from all over the world. For further information either visit the Tourist Information Centre in the Town Hall, Cheapside, call 01729 825192 or click here. Horton in Ribblesdale is an ideal starting point to climb one of the famous ‘Three Peaks’ of Pen-y-ghent, which means the ‘hill of winds’ at 2,272feet (694m), Ingleborough at 2,373 feet (723m) and Whernside the tallest at 2,418 feet (736m). Whilst it is possible to climb all three in one day, a total of 24 miles, this is never attempted from DalesRail! 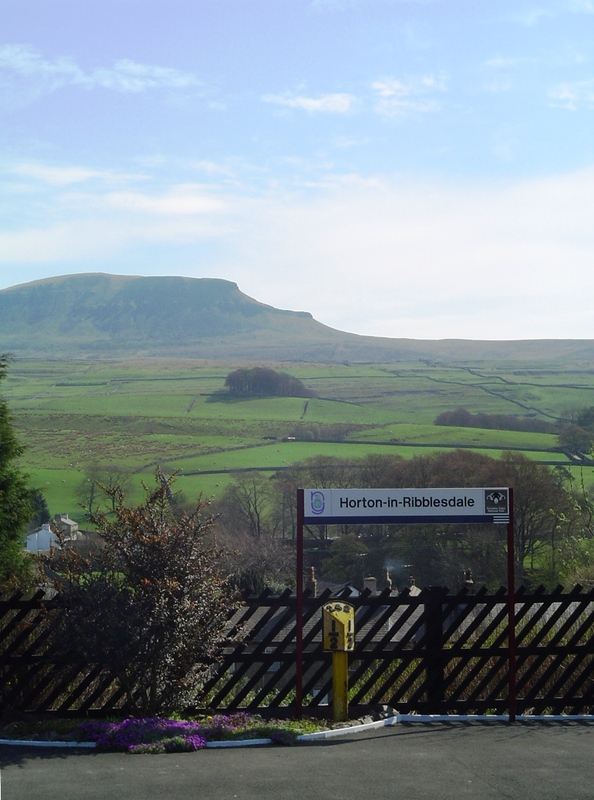 For more information about Horton in Ribblesdale click here. Alight here for the coach link to Wensleydale, The station building has recently been refurbished by the settle Carlisle Railway Trust and contains a Visitor Centre with exhibits telling some of the history of the line. 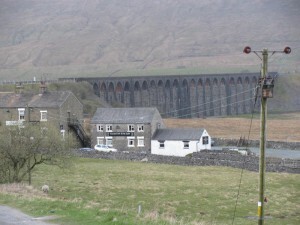 There are excellent views of the ‘three peaks’ and Ribblehead Viaduct from the station. 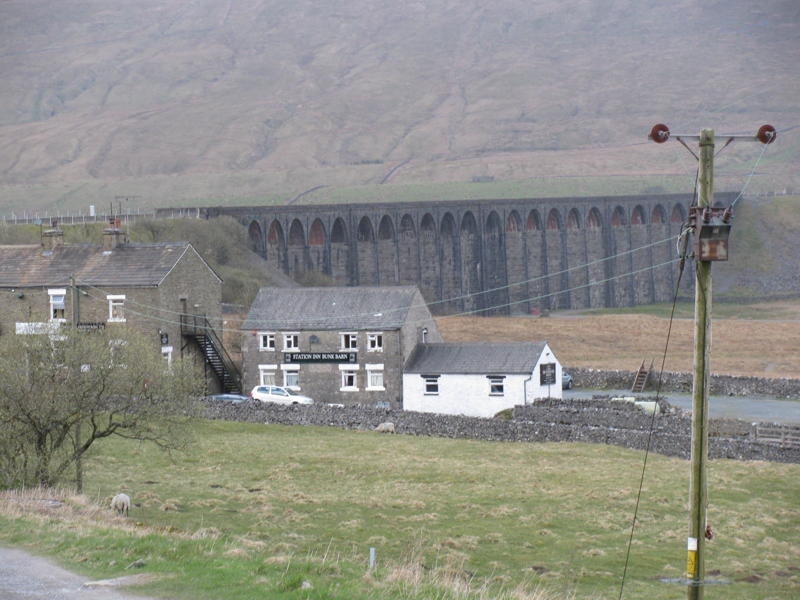 Ribblehead Viaduct was at the heart of the campaign to save the line in the 1980′s and consists of 24 arches, is 440 yards long and 100 feet above the delightfully named Batty Moss. It is possible with an eagle eye to spot where the navvies who built the line lived. Use the link here to find out more about the station. After crossing the viaduct the train passes by Blea Moor signal box (on your right) and into Blea Moor tunnel which is 2,629 feet long. For more information about the tunnel click here. From Ribblehead station a coach link will take you across some very remote and bleak countryside on the journey to the market town of Hawes. The name Hawes means the ‘pass between mountains’ and it is situated between Buttertubs, a mountain with limestone potholes, and Fleet Moss. 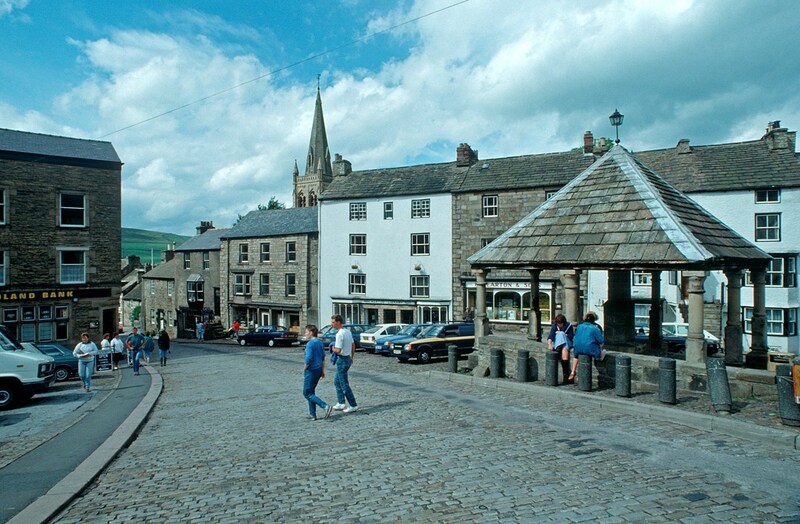 The town is home to a variety of attractions such as the Dales Countryside Museum where it is possible to find out more about life in the Dales, click here to find out more about the museum, the Wensleydale Creamery Visitor Centre, click here for a link to their website and a variety of shops, refreshment rooms and pubs. Travelling on to Leyburn it is possible to travel on the Wensleydale Railway. Trains run every Sunday and link Leyburn with Redmire and Leeming Bar. Click here for more information about this community railway. Near to Redmire station is Bolton Castle and if you click here you will find out more about this interesting attraction. On certain Sundays a coach link will take you from Ribblehead station to Richmond, an historic market town on the River Swale. Click here to see a detailed sheet about Richmond. Swaledale is the northernmost of the dales in the Yorkshire Dales National Park and more information can be found by clicking here. 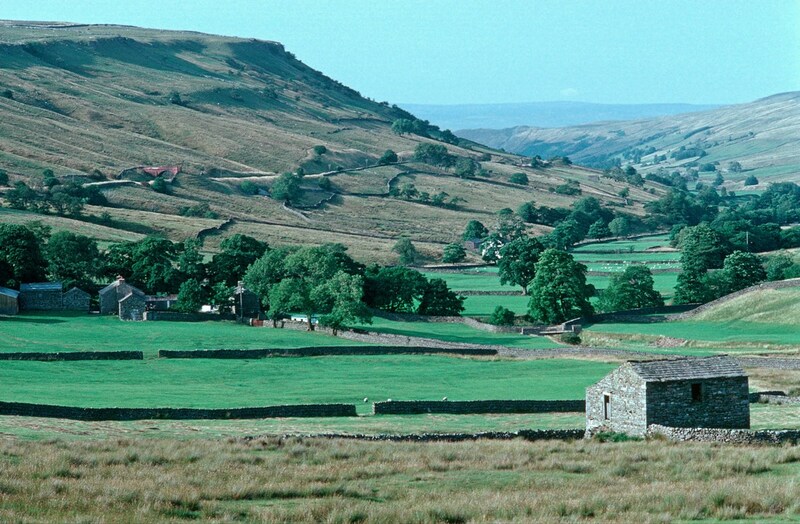 Wensleydale runs parallel to Swaledale and is unusual in that it is not named after its principal river – find out more information by clicking here. Cobbled street in the Yorkshire Dales village of Dent. After coming out of Blea Moor tunnel and crossing Dent Head and Arten Gill viaducts the train enters Dent station. Magnificent views of Dent Dale can be had from the train window along this section of the journey. Make sure you are seated on the left hand side of the train and enjoy, you will not be disappointed!! 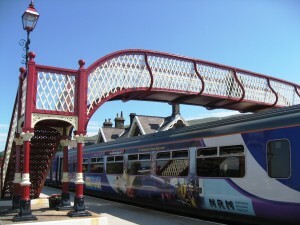 The station lays claim to being the highest main line station in England and is the starting point for the coach link along Dent Dale to Dent and Sedbergh. The station is about 4 miles from the village which is some 600 feet lower. 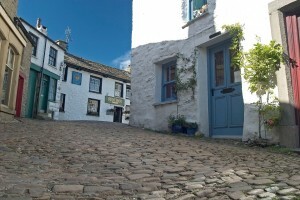 Dent village retains much of its traditional feel with cobbled streets and colour washed stone cottages. Adam Sedgwick, the father of geology, was born in Dent in 1785. Click here to find out more about the area. Dent was once a major hand knitting centre producing gloves and hose. Click here to find out more about this once important local industry. From Dent the train passes through Rise Hill tunnel (1,213 feet long) and enters into Garsdale. This lovely town can be reached using the Dent Dale coach link. 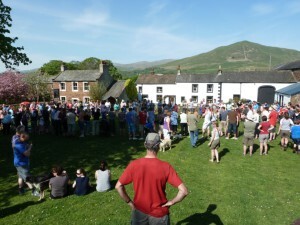 The town nestles at the foot of the Howgills and is an excellent starting point for many walks in this delightful area. Click here to find out more about this lovely area, the Howgills and walking opportunities. This is one of the wildest and loneliest of the stations on the settle Carlisle line and was once the junction for the Wensleydale Railway that went all the way to Hawes and Northallerton on the East Coast Main Line. On the left is the bleak Baugh Fell rising above the lesser known Grisedale. The ‘Coal Road’ passes by the station on its way back to Dent. The fells in this area form a watershed between the Rivers Ure and Eden. Leaving Garsdale the train passes through one of the most scenic parts of the journey. Look out for Ais Gill the highest point on the line at 1169 feet above sea level. The train hugs the side of Wild Boar Fell (2,324 feet) and the eagle eyed will spot on the right the village of Outhgill and the ruins of Pendragon Castle – named after Uther Pendragon the castle is supposed to be birth place of his son, King Arthur. The castle was restored by Lady Anne Clifford in the 1660′s. On the opposite side of Mallerstang is Lady Anne Clifford’s Way. Click here to find out more about this 100 mile long distance path that runs from Skipton to Penrith. On the approach to Kirkby Stephen Station is Lammerside Castle but you will have to be really quick to spot this! Click here for more details of this interesting ruin. The train is now entering the Eden Valley. Although the station is about 1½ miles from the town a footpath does provide a safe way to get between the two. Kirkby Stephen is a market town built with narrow streets leading to squares for the safe penning of livestock during the border raids. The town was granted a market charter in 1361 and a weekly market is still held every Monday. In the centre of the town are the cloisters that lead to the church of St Stephen. 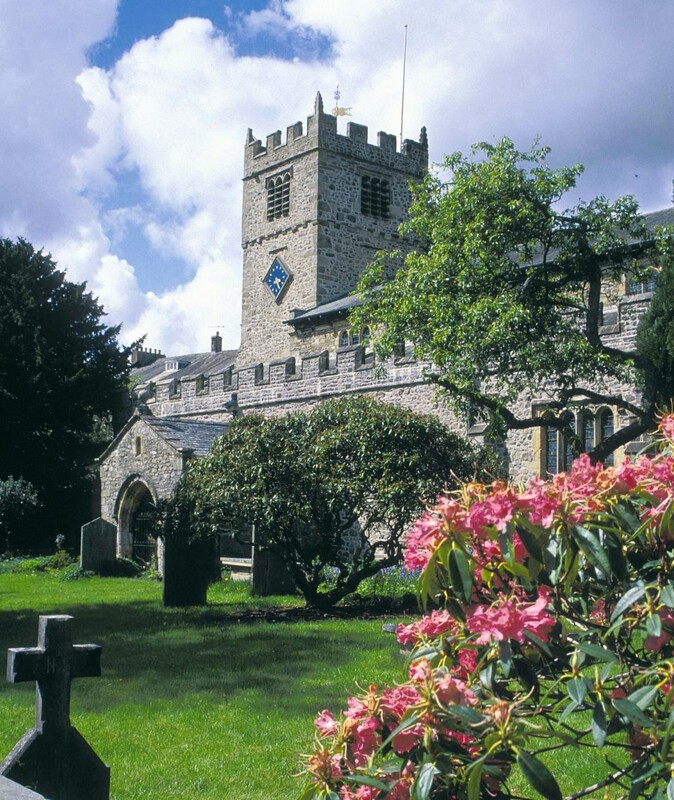 This was built on the site of an old Saxon church and is often called the ‘Cathedral of the Dales’. On the western edge of the town is the site of Croglin Castle, an example of a prehistoric earthwork. The Devils Mustard Mill and Stenkrith Park are a short walk from the town and there are many hungry ducks down by Franks Bridge as you cross over the River Eden! On selected Sundays there are special coach links from the station to the Upper Teesdale region, Middleton in Teesdale and the Howgills. For more information about Kirkby Stephen call the Tourist Information Centre on 017683 71199 or click here to look at the local web site. The Merrygill and Podgill viaducts between Hartley and Stenkrith Park, Kirkby Stephen form part of a short linear walk – also known as the ‘Poetry Path’ because of the 12 stone sculptures with verses on them outlining a year in the life of a Dales farmer. The viaducts are wonderful monuments and the interpretative panels make it possible to piece together the impact of the railway on the environment and local economy. Using other footpaths this can form part of an enjoyable circular walk from Kirkby Stephen. For more information about this walk click HERE and download the walks guide. 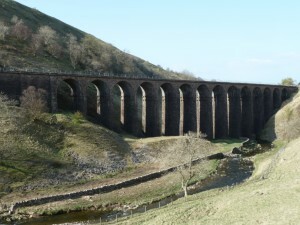 A linear walk between Smardale and Ravenstonedale takes in the graceful Smardale Gill Viaduct that crosses the delightfully named Scandel Beck and passes through the Smardale Gill Nature Reserve. The path was once part of a route linking Tebay (on the West Coast Main Line) with Kirkby Stephen East and Barnard Castle. Trains from Blackpool to Darlington once passed along here! The track bed has now been converted into a footpath and can be reached from Kirkby Stephen station. Turn left when leaving the station and a short walk along the A685 to Lane Head junction. Turn right onto the narrow lane that is signed Waitby and follow the instructions in the Northern Viaduct Trust walk guide that can be downloaded by clicking HERE. To find out more about the Smardale Gill Nature Reserve and the work of the Cumbria Wildlife Trust click HERE. 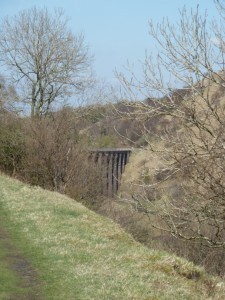 To find out more about the railway and for some excellent photographs of the Merrygill and Podgill Viaducts click HERE. For a detailed read then look out for ‘The Stainmore and Eden Valley Railways’ by Peter Walton and published by the Oxford Publishing Company in 1992. A few miles south east of Kirkby Stephen lies Nine Standards Rigg, the summit of Hartley Fell in the Pennine Hills of England. It lies near the boundary between Cumbria and North Yorkshire, approximately 770 yards (700 m) outside the Yorkshire Dales National Park. 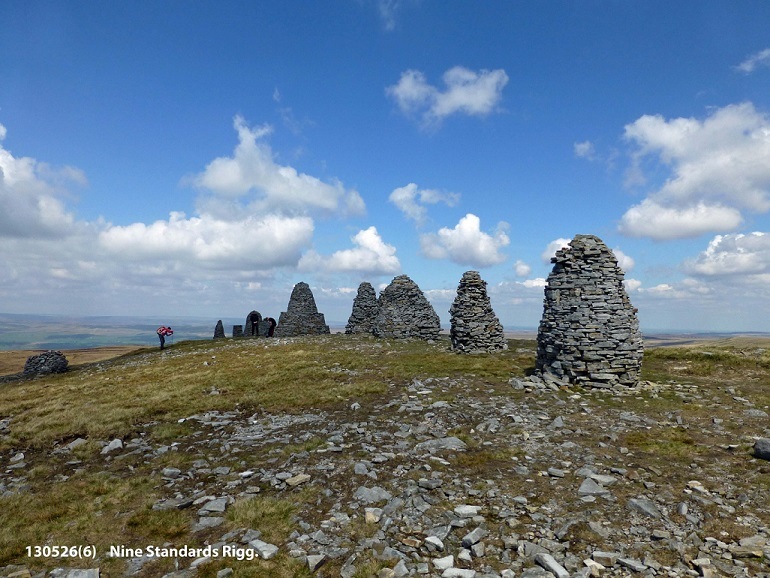 Nine Standards Rigg lies within the North Pennines Area of Outstanding Natural Beauty (AONB). The name is derived from a group of standing stones or cairns, the Nine Standards, located near the summit. The Nine Standards themselves, some of which were originally more than four metres high, are on the line of the Coast to Coast Walk between Kirkby Stephen and Keld, and are just to the north of the fell’s summit. Situated at a height of 650 m, their original purpose is uncertain but one possibility is that they marked the boundary between Westmorland and Swaledale. The station is situated above the town and from the over bridge there are excellent views towards the Lakes. 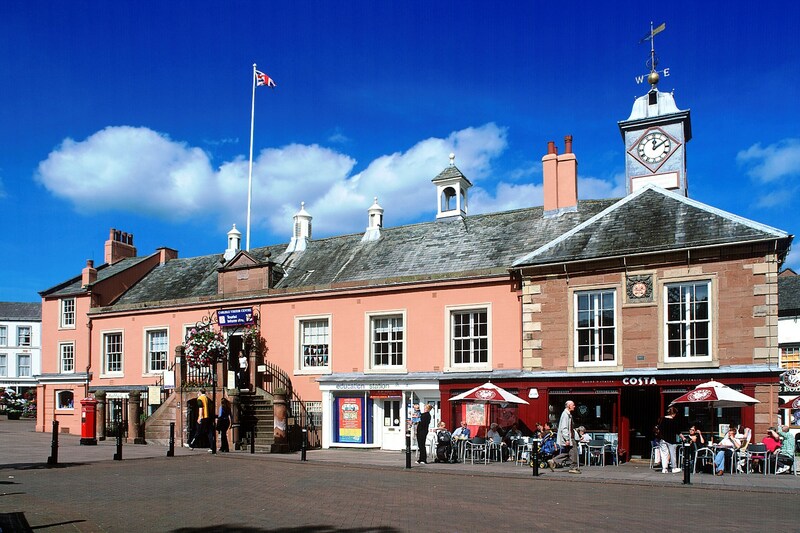 Appleby is a picturesque market town set in a loop of the River Eden. A DalesRail Country leaflet has been produced setting out a short walk around the town and detailing places of interest. To view a copy of this leaflet click here Appleby is famous for its annual Horse Fair held during the second week in June when the population is swelled by large numbers of gypsies, horse traders and visitors. The town is the starting point for a large number of not too strenuous walks taking in places such as Flakebridge Woods, Dufton, High Cup Nick, Ormside, Rutter Falls, Drybeck and Acorn Bank. A DalesRail Country leaflet has been produced to help you get the most out of a visit to Appleby click here to view the leaflet. For more information call the Tourist Information Office on 017683 51177 or click here for information about the town, walks and other facilities. Langwathby is a delightful Eden Valley village and a short walk from the station. A large village green occupies the centre of the village and is bordered by cottages and farmhouses. There are many walks from the station with careful planning you can take in Long Meg and her daughters, click here to find out more and the Little Salkeld Watermill that produces a range of products including biodynamic organic flour with a good café and shop, click here for more details. On selected Sundays there are coach links from Langwathby to Alston, Hadrian’s Wall and Nentdale/Killhope. Killhope was once a centre for lead mining and the link here provides lots of useful information about the site. There is plenty of information about Hadrian’s Wall available on the web but click here for one about the Hadrian’s Wall path. A lovely station on the line and the home of Bells Bakery. About three miles away are the lovely Lacy Caves set above the River Eden which were carved out of a sandstone cliff by Lieutenant Colonel Samuel Lacy who lived in Salkeld Hall in the 18th century. It is not clear what the caves were used for perhaps it was to store wine or simply as a folly. It is said that Lacy employed a man as a hermit to give an authentic appearance to the caves. By the banks of the River Eden the village is only a short walk from the station. The Eden Valley Woollen Mill designs, weaves and sells clothing, rugs and accessories. The village church was originally built in 1402 but fell into disrepair. It was rebuilt in 1660 and remains much the same today, although one of the stained glass windows is of the Pre-Raphalite school made in 1926 by the William Morris workshop. This is the end of the line and there is much to see and do in the city. A DalesRail Country leaflet has been produced to help you get the most out of a visit click here to view the leaflet. 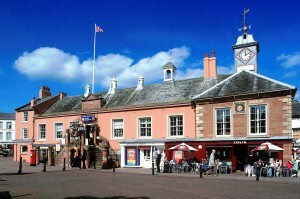 The Tourist Information Centre can be contacted on 01228 625600 and to find out more about the city click here.